In a bare concrete hall, women rummage through second-hand clothing on makeshift wooden tables. "We call it caguwa wishyure, which means pick and pay," says our guide Shema. "You can also say caguwa to a loved one. To show her she's unique and there's nothing else like her." This is the second insight we've had into Rwandan courtship today. Earlier we visited a tailor that specialises in a sarong that men buy their wives to apologise after an argument. Embroidered in Swahili across the bottom is the phrase: "Every good word comes from God". I'd be tempted to add "or my wife" for extra brownie points. 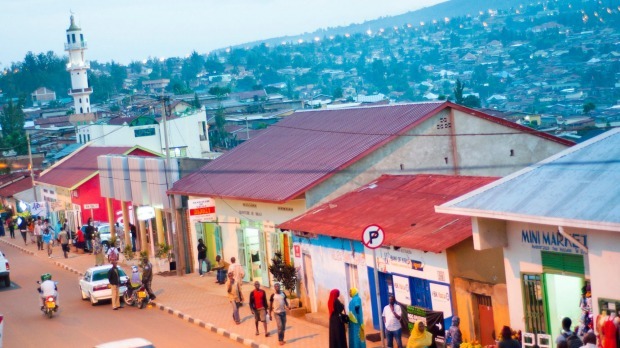 This walking tour around Nyamirambo, one of Kigali's oldest and most vibrant neighbourhoods, is an exclusive inclusion on this nine-day G Adventures/National Geographic Journeys trip through Rwanda and Uganda. The tour is offered by the Nyamirambo Women's Centre (NWC), a project started in 2007 by 18 Rwandan women with the help of a Slovenian NGO. The aim was to provide education and vocational training to local women in an effort to address discrimination, violence and a lack of opportunity. Despite staffing and funding challenges, the project has been a resounding success. Today, the NWC offers women free English, literacy, sewing and computer classes. It also provides paid employment, allowing them to use the centre's facilities to make clothes and handicrafts, which are then sold in the on-site store. This walking tour was introduced in 2009 and has become one of Kigali's most popular tourist activities. Since then, they've added cooking and basket weaving workshops. When we arrive at the NWC, we're met by its softly-spoken president Marie Aimee Umugeni. She teaches us some phrases in the local Kinyarwanda language and encourages us to practise them as we walk around the neighbourhood. Our guide today is Shema, a 20-year-old electrical engineering student who works here part time. He leads us through the centre's workshop where women are making colourful clothes and accessories from a high-quality local fabric called kitenge. Across the road is a finishing room, where a dozen women sit in a circle sewing intricate details by hand. From the easy laughter and camaraderie, it's clear this is as much a social outlet as it is a workplace. We follow Shema through the district's dusty streets, past simple storefronts and mud-brick houses with corrugated roofs. Women in vibrant dresses glide by, sleeping babies strapped to their backs and water containers balanced on their heads. We visit a women's hair salon where a stylist is carefully applying a thick white cream to a customer's hair to soften it before braiding. In the barber shop down the street (the Gift God's Salon), the style menu includes photos of Will Smith, Nicholas Cage and Prince William with a mohican. All around there is motion and industry. In an open-air laundry, a man carefully smooths a shirt using a metal iron filled with hot charcoal. Nearby a lady makes flour from cassava roots. On street corners, illegal disk burners blast soundtracks from the latest pirated movies. The tour finishes with lunch at Mama Claude's house. Like many local families, she lives in a compound of five houses that share a single bathroom and kitchen. All of which makes the delicious feast of rice, beans, sweet potatoes and local vegetables we enjoy all the more impressive. As we prepare to leave, I wonder if "caguwa" can also be used to compliment a meal. After all, it was unique and I haven't had another like it. I decide not to risk it, settling instead on a hearty "murakoze!" (thank you). Humouring my terrible pronunciation, Mama Claude smiles graciously. Highlights of G Adventures/National Geographic Journeys' nine-day Rwanda and Uganda Gorilla Discovery tour include treks to see mountain gorillas, golden monkeys and chimpanzees plus exclusive experiences such as this walking tour of Nyamirambo. From $5269 per person. See gadventures.com.au.